May 11, 2013: Spring has sprung! I'm sorry for the break in communication if anyone had been looking forward to a blog post. I have just touched base with my dad and here's the current report from Town St. Some Maple Syrup has made it's way to Indonesia and potentially even the prime minister of Indonesia and part of a peace Conference. The Farmer's Market in West Cornwall started today, with a strong attendance despite the rain. Rebecca pushed the ramps and we also had a good amount of greens, as well as yellow cherry tomato plants that are already producing fruit. Many members of the press were present, so keep your eyes peeled on the newspapers, etc. The Kent Farmer's Market will begin next week. Plants are being planted despite the kind of slow start to the growing season, and the dry weather. Tomatoes, onions, leeks, carrots, spinach, beets, and garlic are all growing nicely. Broccoli and cauliflower have germinated with the assistance of the recent rain. 400 pounds and seven varieties of potatoes have also been planted and sunflowers are breaking through the ground. Melons and peppers are in the greenhouse and ready to be transplanted when the weather breaks. Our good friend, and fellow farmer, Gordon Whitbeck is also growing three varieties of eggplant for us on his Salisbury farm. A new vegetable this year is black cherry tomato, which will appear more like cherries than tomatoes. The 2013 edition of our share program is preparing to launch. Please check that section of the website for prices and details. A shout out to Ivy June, who has already been at the farm (mainly gurgling) at the age of three months, "working" alongside her father, mother and grandmother. Lastly, if you mention this "Blob" at either the Kent or the West Cornwall Farmer's Markets, next week, you will receive a 25% discount! 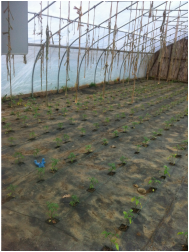 Tomatoes are planted in the greenhouses. Ruadh wanted credit for her "efforts", so she left her little teddy bear as evidence she was there. (Thanks to Ian for sending me this picture). Please feel free to send us any pictures you have of the farm! We'll post them on here, facebook, and twitter! April 19, 2013- The Blog is up! First of all, our hearts and prayers are with those in the Boston area (we are avid Red Sox fans), and in West, Texas. We send our condolences to those who have been affected by these terrible events. Secondly, it is finally spring on the farm. Gordon and crew planted onions, lettuce, carrots, spinach, beets, FOUR types of peas, broccoli, cabbage, and bok choy today! Last year's weather permitted us planting the veggies a month earlier, but at least we have the seeds in the ground. Look forward to these veggies shortly! Thirdly, Rebecca is updating our facebook with pictures, so definitely check those out. And if you can not access them, let us know. Definitely like us on Facebook and follow us on Twitter. Please comment on the blog if you enjoyed it and especially if you didn't and feel free to contact us! It's just me Elizabeth at this point. Hopefully we'll get more perspectives as we continue to build the website!